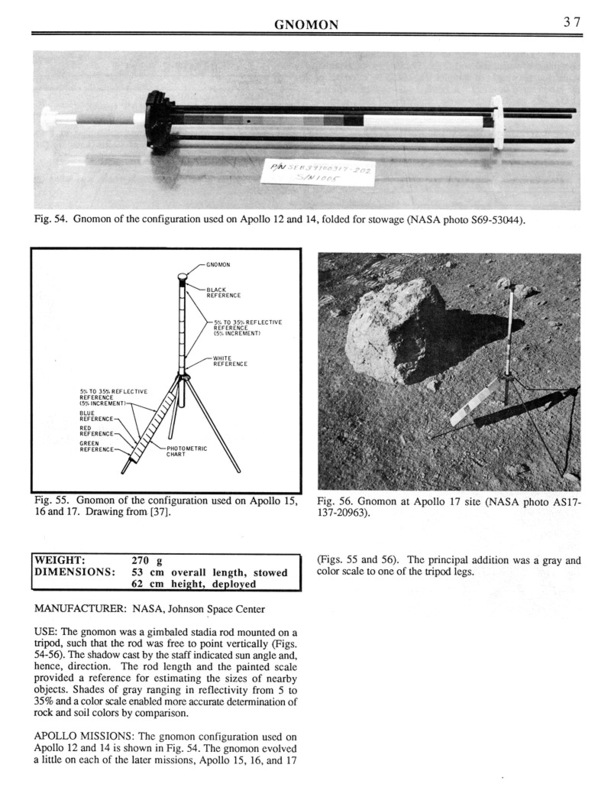 Query: Does anyone know the dimensions of the Apollo Gnomon, specifically the size and weight of the vertical bar used to show the local vertical? I should know this . . .
"A gnomon is atop the large rock in the foreground. The gnomon is a stadia rod mounted on a tripod, and serves as an indicator of the gravitational vector and provides accurate vertical reference and calibrated length for determining size and position of objects in near-field photographs. The color scale of blue, orange and green is used to accurately determine color for photography. The rod of it is 18 inches long. The scoop Dr. Schmitt is using is 11 3/4 inches long and is attached to a tool extension which adds a potential 30 inches of length to the scoop." There were 2 major versions of the gnomon, but it seems they were all a bit different. Early version had color bars on the stadia rod only, later versions had color bars on the leg and greyscale on the upright. Here's one version of the "pendulum" video, just to get the data into one place. Is that the weight visible at the bottom there?